Netflix? Get on this right now! Bronwyn, a brainy girl set on going to Yale, is given detention for having her phone in class. The thing is, it was not her phone but the teacher does not believe her. He also doesn’t believe Cooper, the star athlete, Addy, the beauty, and Nate, I guess you would call the classic delinquent. And then there is Simon. Simon runs a gossip app called About That. He spreads the high school gossip around like butter. When Simon has an allergic attack and things go horribly wrong, the four kids are all suspected of murder. Who is lying and who is telling the truth? I loved these kids so much. 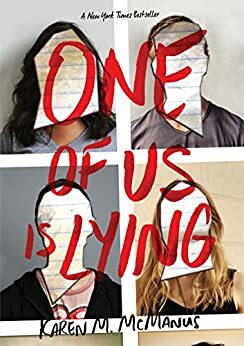 As much as I loved the mystery and the twists, my favorite part was watching all four grow into the people they were meant to be. They throw aside the petty high school cliques and become real friends. Of course, in the back of your mind you are wondering if one of them is the murderer and I am not going to spoil that. I had a feeling that ended up being right, pat myself on the back, but there are a few things that were surprising. The other characters are so thought out as well, the sisters especially. I loved Maeve’s chutzpah. I had a silly smile on my face at the end. I am sure you will too. This is such a wonderful debut novel and I cannot wait to see what comes next from Ms. McManus!